I first met Luiz in March of 2015. My shoulder was still bothering me after my English Channel swim and my torn bicep tendon injury. I felt my stroke needed changing so I booked a swim camp in Malta with Adam Walker. Luiz was also on the same camp. We got on instantly. Luiz also has two boys, albeit younger than mine. I was nervous about over working my shoulder and he was nervous about ‘large sea life’! We gravitated towards each other and swam really well together. On day five, which was the six hour swim, we swam the whole swim together! Luiz’s left lower leg is missing from just below the knee. When we first swam together, I was impressed by his independence and determination. I offered help once he had removed his prosthetic limb and he politely and firmly let me know he was fine. At the end of our six hour swim, we started to swim for shore. As it got shallower, I stood up and started to walk. Luiz called out to me “my swim sister, could I ask you for some help this time”. I put my arm around him and we made our way into shore. This created a real bond. When we said our goodbyes a few days later, we promised to keep in touch. I also said to Luiz, if he ever needed me to crew for him I would try to be there. I heard from Luiz a few months later that he was in Dover and waiting to swim the English Channel. His coach John and his brother Henrique were there to crew for him. Luiz’s chance to swim came. I tracked him and after about three and a half hours I saw the boat turn around. It was a rough start and was too much for Luiz. He was violently ill due to rough conditions and just couldn’t carry on. We spoke after this attempt and I decided to come to Dover immediately to be there to crew for Luiz should he get another chance. Well, the weather worsened and we waited a further five days. Luiz went home to Dubai (he’s from Brazil but works in Dubai) and I went home to the Netherlands. Luiz and I kept in touch. He would say to me “my swim sister, I am losing faith! Will I ever get the chance to swim the English Channel?” I would respond “Keep the faith Luiz! Your chance will come! BUT you must keep your head together otherwise all this training you are doing will be pointless!”. Luiz’s training was impressive. Of that, I had no doubt. A few months later he went to Brazil to compete in a cold and rough 20+km swim and did really well. This was great for his confidence. 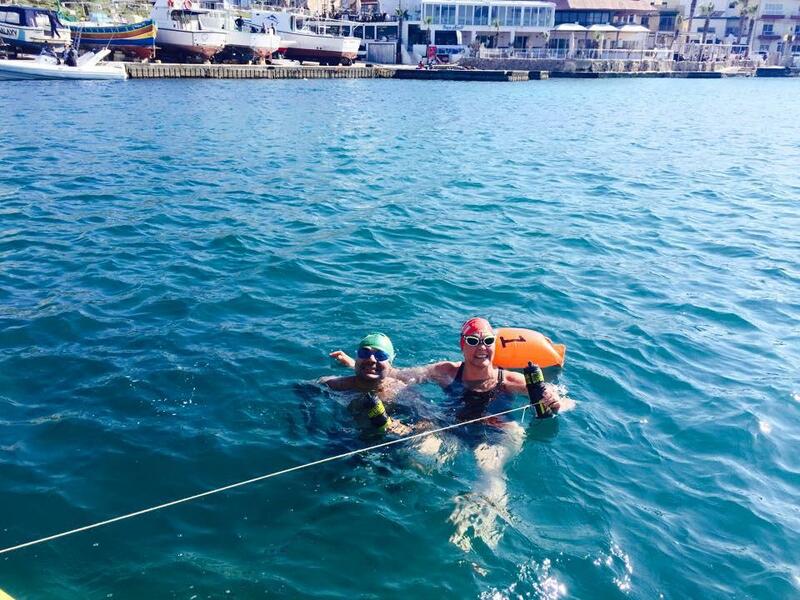 On Wednesday 20 July 2016 I got an email from Luiz “My swim sister, Neil Streeter has said I can come and swim this Friday. Can you be there for me?”. My reply was a simple “yes”! He jumped on a plane from Dubai and, now I was living in Norwich, UK – I jumped in the car and drove down to Dover and to Varne Ridge where we were staying. Mum and Dad (David and Evelyn Frantzeskou) had dropped everything and organised one of the two bedroom caravans for us!. On the Thursday evening, we premixed all his energy drink. I wanted to do this as I was crewing completely alone and needed to make things as easy as possible. I didn’t let on to Luiz, but I was quite nervous as I was crewing alone for the first time! 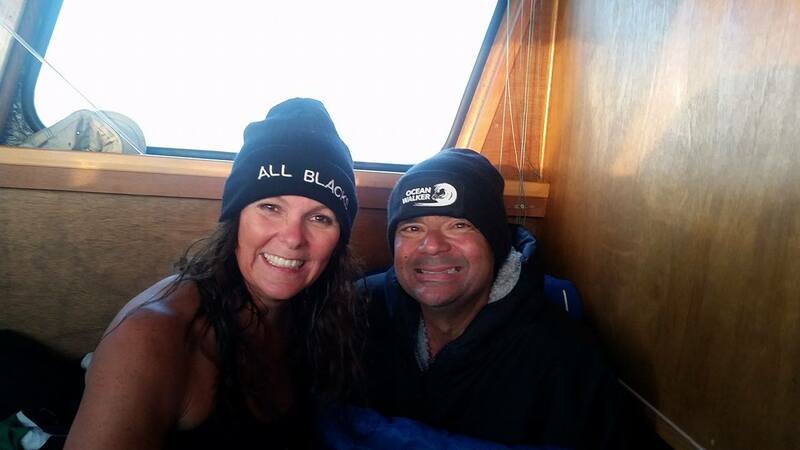 Every other swim, I had crewed with Roger. I felt completely confident and competent, however it is a huge responsibility to be in charge of someone’s dream alone! 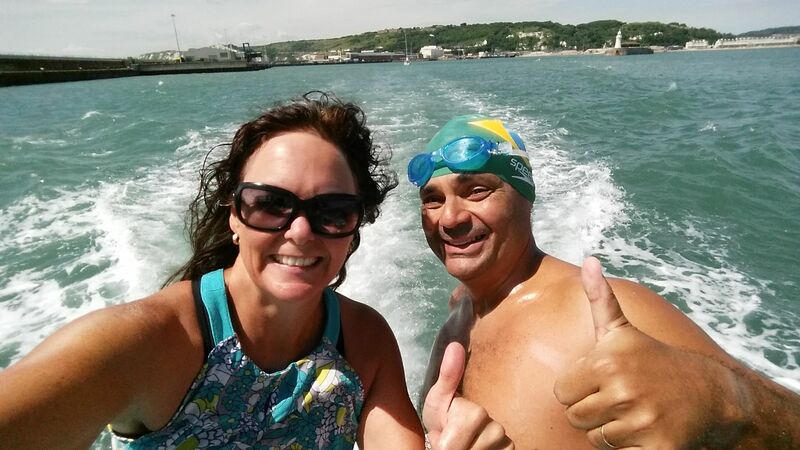 Luiz’s swim started early afternoon on the Friday in Caribbean like conditions – HOT beautiful sunshine!! Everything went along really smoothly. I got into a routine. I would signal Luiz five minutes before his feed was due. I would pour out his drink and add hot water. Luiz swam along so steady and strong. No complaints and very few questions. We had also agreed the night before that I wouldn’t answer any questions anyway!!! I was in contact with his wife Joelma and passed on messages to Luiz that Joelma and his two boys were so proud of him and were tracking him. Being out in the English Channel on a calm and clear night is simply stunning. I looked up and I could see my beloved Orion’s Belt watching over us. Luiz yelled out at some point that he had been stung by a jellyfish on his face. My response was “how lucky, you got a jelly kiss”! I’m not sure if he heard me, but he kept on swimming. Just before midnight, Luiz was slowing up a little (which is to be completely expected). I started to add an extra spoonful of his maltodextrin powder to his drink. We had premixed enough drink for a 16 hour swim and didn’t have much left! I did this for every feed until the end. 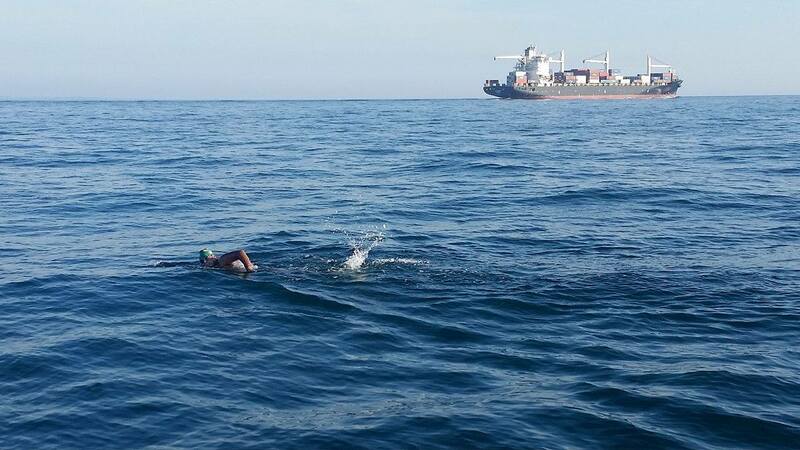 It is well known amongst Channel swimmers, you hit currents about 3-5 kilometres off the coast of France. You swim all this way to start your swim! At this point you have to break out of the tide and currents. You’re tired and sore and you must dig in! When Luiz stopped for his feed I shouted to him “Listen to me. You will make it to France BUT you must dig in and give me EVERYTHING now”. He simply shouted “I understand”. We had already discussed that I would say this to him at some point and that HE MUST LISTEN and do what I was asking. After about thirty minutes I checked with Captain Neil (Streeter) and sure enough, Luiz had picked up speed. Just a little but enough to be making good progress. From this moment on I had tears in my eyes. I knew my friend was going to make it. What seemed forever, Sam (Sam Jones who crews for Neil) came out and told me it was time for me to get ready to swim Luiz into France. Luiz had given me a cap from Brazil which I proudly put on. The sun was just coming up and the sea was stunningly calm. I jumped in and swam next to my friend with tears in my goggles! Luiz had given me his waterproof camera. I took photos of him swimming in and then turned it to video. Here is a video of Luiz crawling up the beach to finish his English Channel solo swim. You can hear the emotion in my broken commentary. After all the communications telling my friend to “keep the faith and his day would come”, it was too much for me watching him crawl ashore! 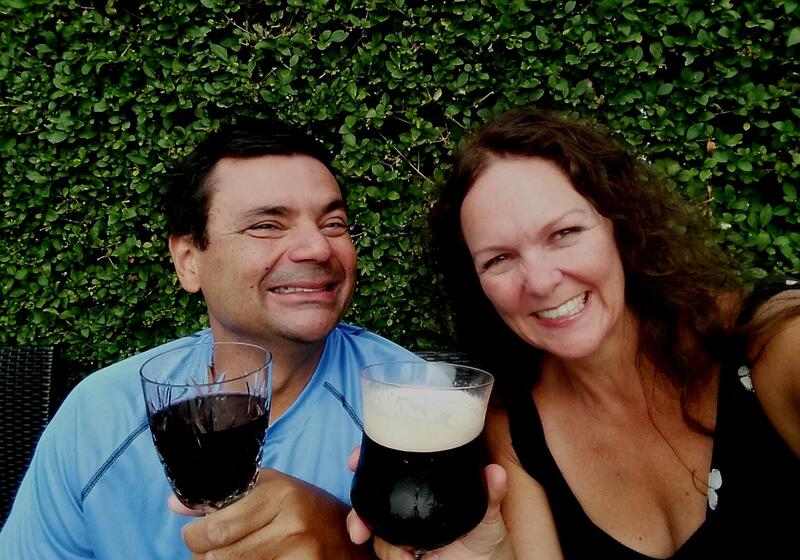 We only had time for a quick celebration with David and Evelyn at Varne Ridge. The amazing Pat Gallant-Charette from the USA was also staying at Varne Ridge and joined us for a celebratory meal at the Royal Oak. 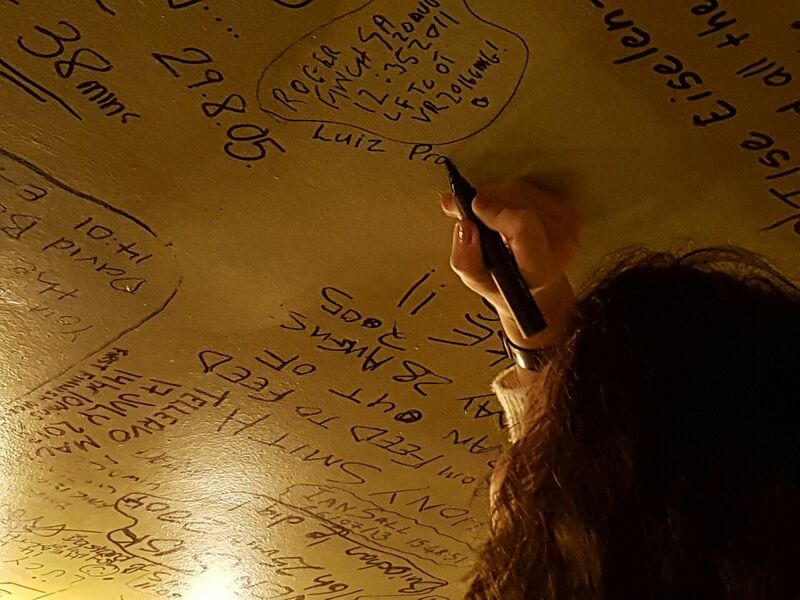 Luiz couldn’t get to the White Horse to sign the infamous walls due to the trucks blocking the roads. I have since signed on his behalf…not the same but room is running out! You kept the faith my friend, your day did come to achieve your dream. A message Joelma sent to me when I told her I was about to swim you in to France – she said “he is my hero”! 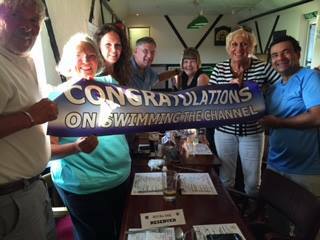 I will always be so proud of you and your English Channel swim!